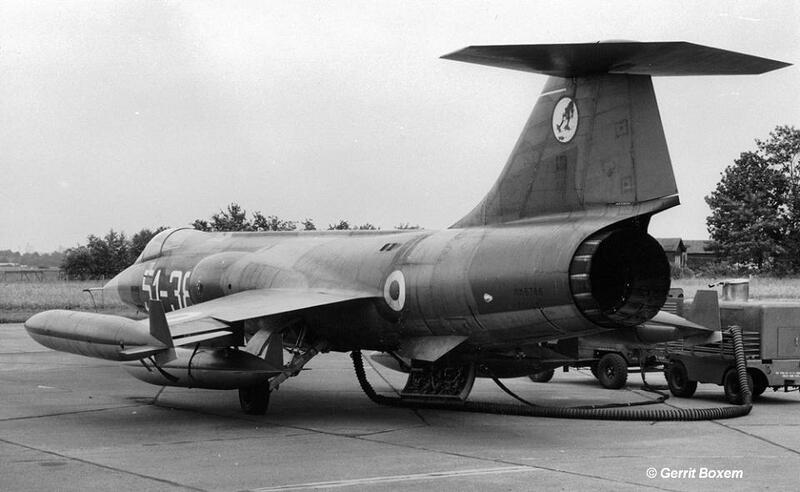 This period a squadron exchange took place between the German Navy MFG2 based at Eggebek, operating the F-104G Starfighter and the Royal Air Force 11 Squadron at Binbrook flying the Lightning fighter jet. It was a two-way exchange. The Germans flew to the UK with 6 Starfighters. 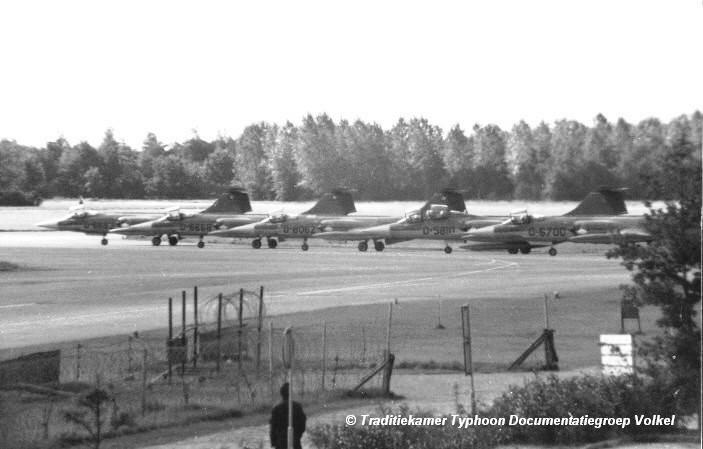 This period a squadron exchange took place between the Dutch Air Force 323 Squadron based at Leeuwarden AB and the Danish Air Force 726 Eskadrille at Aalborg both operating the F-104G. It was a two-way exchange. Danish Starfighters seen at Leeuwarden were R-343, R-698, R-703 and R-754. Dutch Starfighters seen at Aalborg were D-6652, D-8098, D-8105 and D-8319. On March 27th, CF-104D 104660 visited Leeuwarden Air Base for a pre-exchange meeting and left the next day. Beneath some photos, first R-698 while landing at Leeuwarden taken by Gerrit Hiemstra, and the second photo shows R-754 at the flightline, taken by Eric Tammer just after arrival on March 19th. This year a shifted squadron exchange took place between the Belgium Air Force 349 Squadron (1 Wing) based at Beauvechain AB, flying the F-104G and the Italian Air Force 22 Gruppo based at Istrana AB flying the F-104S. 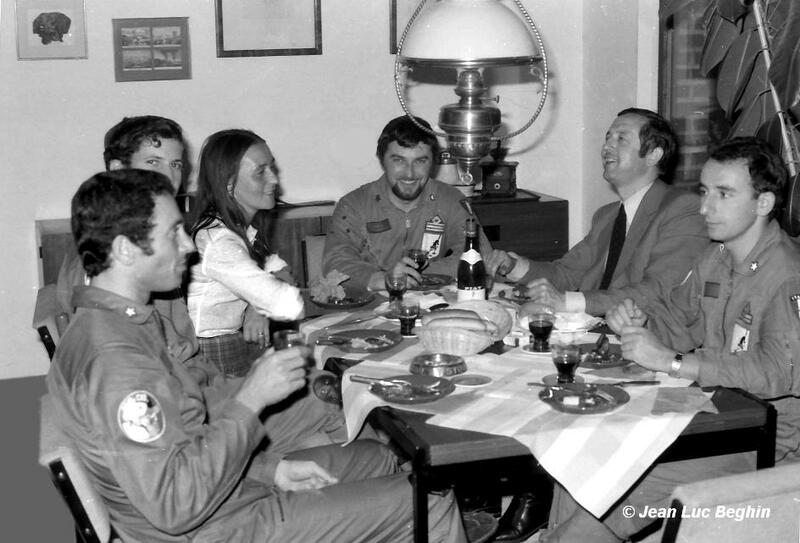 During April 349 Squadron flew to Istrana while during June 22 Gruppo visited Beauvechain. Sadly we do not know which Belgian Starfighters were involved in the exchange. This month Danish F-104G Starfighter squadron 726 Eskadrille had a squadron exchange with a USAFE squadron based at Ramstein AFB (86 TFW) flying the F-4E Phantom. An unknown number of Starfighters flew to Germany. It is unknown if the Americans also flew to Denmark. 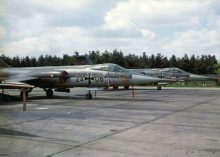 This month a squadron exchange took place between the German Air Force JG74 (2nd Staffel) based at Neuburg AB, operating the F-104G Starfighter, and a French Air Force Mirage IIIC squadron EC 1/5 based at Orange. It was 2 way exchange where 4 Mirages flew to Germany and 5 Starfighters to France. This period a squadron exchange took place between the German Navy MFG2 based at Eggebek, operating the F-104G Starfighter, and the French Navy 11F squadron at Landivisiau flying the Etendard IV M. It was a 1-way exchange, only the French aircraft came to Eggebek. This period a shifted squadron exchange took place between the Dutch Air Force 316 Squadron, flying the NF-5 fighter-bomber, based at Gilze-Rijen AB and the Canadian Armed Forces 421 Squadron of the 1st CAG, based at Baden-Sollingen AB, operating the CF-104 Starfighter. First on May 27th, the Canadian Starfighters flew to Holland. In August the 2nd part started where the Dutch NF-5 aircraft flew to Sollingen. The Canadian Starfighters seen at Gilze were CF-104's 104785, 104786, 104827, 104839, 104843, 104866, 104892 and CF-104D 104661. At the end of the day of the arrival (27th), three aircraft (104827, 104843 and 104785) flew to Leeuwarden AB where they stayed the weekend. They returned May 30th again. 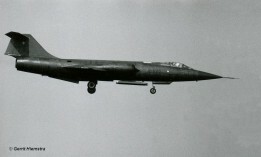 The timing of the exchange was held to help clear based aircraft away from Baden-Sollingen to make space for the 1974 TWM between held between May 25 and 31. Photo beneath shows CF-104 104843 ready for departing, on May 30th, back to Gilze Rijen after staying the weekend at Leeuwarden Air Base. Photo by Gerrit Hiemstra. This year a squadron exchange took place between the French Air Force ER 33 flying the Mirage IIIR, based at Strasbourg, and the Italian Air Force 28 Gruppo (part of 3 Aerobrigata) based at Villafranca flying the RF-104G. It was a 1-way exchange where only Mirage aircraft were seen at Villafranca. This month a squadron exchange took place between the Dutch Air Force 314 Squadron, flying the NF-5 fighter-bomber, based at Eindhoven AB and the Italian Air Force 155 Gruppo, based at Istrana flying the F-104S Starfighter. It was a 2 way exchange. Seen at Eindhoven AB were aircraft MM6795/51-42, MM6788/51-38 and two others with codes "51-33" and "51-40" of which we sadly did not record any MM serials. Photo beneath shows MM6788 code 51-38 taken by Gerrit Boxem. This month a squadron exchange took place between the German Navy MFG1 operating the F-104G Starfighter at Schleswig Jagel, and the Belgium Air Force 8 Escadrille, based at Bierset AB flying the Mirage 5BA. It was a two-way exchange. 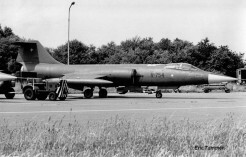 Six Starfighters flew to Belgium and six Mirage 5 aircraft flew to Northern Germany. 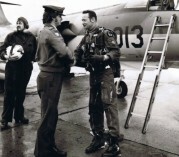 This period a shifted two-way squadron exchange took place between RAF 3 Squadron, flying the Harrier and the Canadian Armed Forces 421 Squadron, based at Baden-Sollingen AB flying the CF-104. The Harriers flew first to Baden-Sollingen in July, while the Starfighters flew to RAF Wildenrath in August. This month a squadron exchange took place between the Turkish Air Force 4 AJU, based at Murted AB and the Italian Air Force 154 Gruppo, based at Ghedi, operating the F-104G Starfighter. It was a 2 way exchange. Italian Starfighters seen in Turkey were F-104Gs "6-02", "6-14", "6-18" and "6-21". (Sadly MM serials unknown). A little after this exchange started, the Cyprus crisis began. No more flights by Italian aircraft were allowed and the Turkish aircraft at Ghedi were recalled back to Murted. This month a squadron exchange took place between the Italian Air Force 156 Gruppo (part of 36 Stormo), based at Gioia del Colle, operating the F-104S and Danish Air Force 730 Eskadrille, flying the F-100D at Skrydstrup. It was a 2 way exchange. This month a squadron exchange took place between the Belgium Air Force 31 Smaldeel, based at Kleine Brogel AB, operating the F-104G Starfighter and the Italian Air Force 102 Gruppo (part of 5 Stormo), based at Rimini, operating the F-104S. It is unknown if it was a 1 or 2 way exchange but at least the Italian Starfighters flew to the home of 10 Wing in Belgium. The participating Italian F-104S Starfighters carried codes "5-02", "5-06", "5-19" and "5-20", sadly all MM serials were not read. This month a squadron exchange took place between the Dutch Air Force 312 Squadron, based at Volkel AB, operating the F-104G Starfighter, and the Royal Air Force 5 Squadron, based at Binbrook, flying the Lightning. It was a 2-way exchange. Duration was 1,5 week. 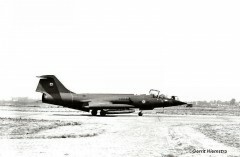 Aircraft which flew to Binbrook were F-104Gs D-6668, D-6683, D-6700, D-8062, D-8256, D-8281, D-8312, D-8337 and two-seater D-5810. 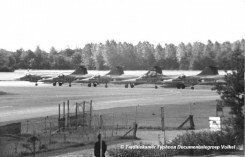 In total three Lightning F6 aircraft came to Volkel AB on August 28th and two more Lightning F6 and a twoseater T5 arrived on September 2nd at Volkel. All departed on September 6th. Photo beneath show the Volkel aircraft ready for departure to Binbrook on August 28th. (Photo: traditiekamer Typhoon documentatiegroep Volkel). This year there was a squadron exchange between the Belgium Air Force 23 Smaldeel (10 Wing), operating the F-104G from Kleine Brogel and US Air Force 494 TFS/48 TFW based at Lakenheath, flying the F-4D Phantom. It was a one way exchange. The Belgium Starfighters visited Lakenheath only. This month a squadron exchange took place between the Dutch Air Force 311 Squadron, based at Volkel AB, operating the F-104G Starfighter, and the French Air Force EC 2/30, based at Reims, flying the new Mirage F1. It was a 2-way exchange. The Dutch flew to France with 8 aircraft being F-104Gs D-6684, D-8047, D-8051, D-8114, D-8258, D-8259, D-8268, D-8300 and TF-104G D-5807. 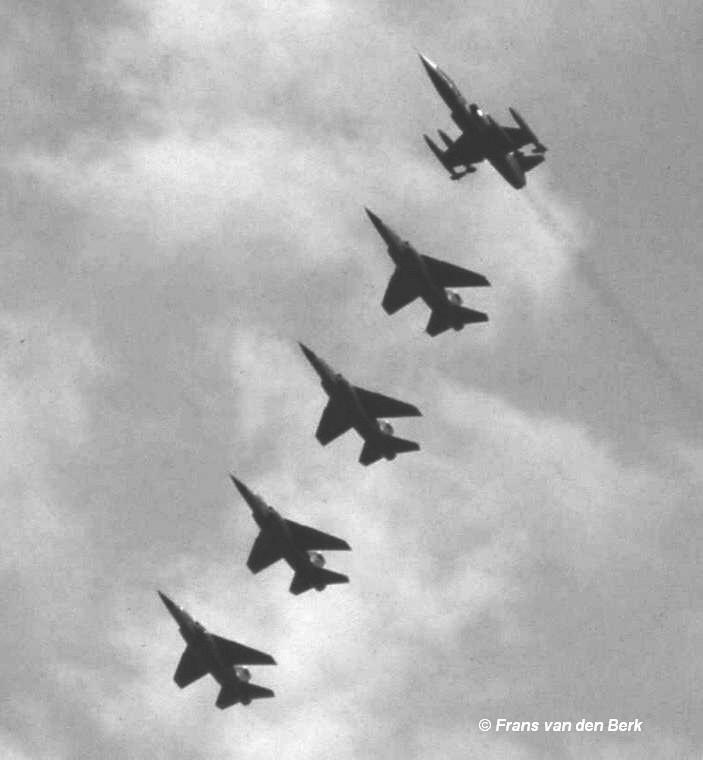 The French squadron came over with 4 Mirages added with two more Mirages arriving on October 11th and 14th.. Photo beneath, taken by Frans van den Berg, shows a formation of 4 Mirages and 1 Starfighter over Volkel Air Base. This month a squadron exchange took place between the Norwegian Air Force 331 Skv, based at Bodo AB, operating the F-104G Starfighter, and the USAFE 22 TFS/36 TFW, based at Bitburg AFB, flying the F-4E. It was a two-way exchange. This month a squadron exchange took place between the Dutch Air Force 322 Squadron, based at Leeuwarden AB, operating the F-104G Starfighter, and the Italian Air Force 12 Gruppo, based at Gioia del Colle, flying the F-104S. It was a one-way event because the Leeuwarden Air Base runway was overhauled from mid till the 31st of October . So only a number of Dutch Starfighters flew to Italy. This period a squadron exchange took place between the Royal Air Force 41 Squadron, based at RAF Coningsby operating the Phantom FGR.2 and the Italian Air Force 132 Gruppo (part of 3 Aerobrigata), based at Villafranca, operating the F-104G Starfighter. It is was a 2-way exchange. Starfighters seen at Coningsby were MM6511/3-43, MM6540/3-39, MM6576/3-44 and MM6588/3-47. Somewhere this year a squadron exchange took place between the Hellenic Air Force 111 Pteriga (Wing) equipped with F-5A at homebase Nea Anchialos, and the Italian Air Force 9 Gruppo, based at Grosseto, operating the F-104S Starfighter. It is unknown if it was a 1 or 2-way exchange. Not much is known about this exchange anyhow. At least it should have taken place before half July because of the emerging Cyprus crisis that moment. This year a squadron exchange took place between the Danish Air Force 723 Eskadrille based at Aalborg AB, flying the F-104G and the Italian Air Force 21 Gruppo based at Cameri flying the F-104S. It was a 2-way exchange. 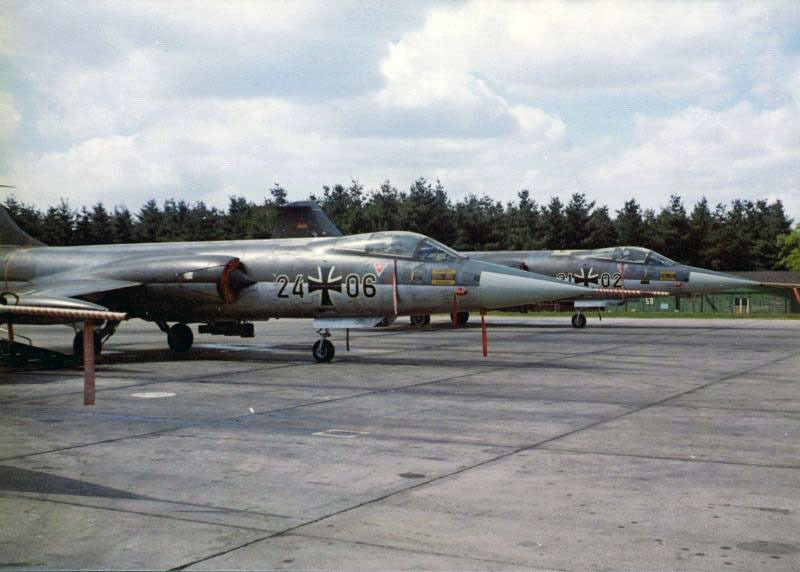 The German Air Force JBG36, based at Hopsten and flying the F-104G Starfighter exchanged with a USAFE F-4D Phantom 91st TFS/81 TFW based at Bentwaters. It is unknown if this was a one or two-way exchange.